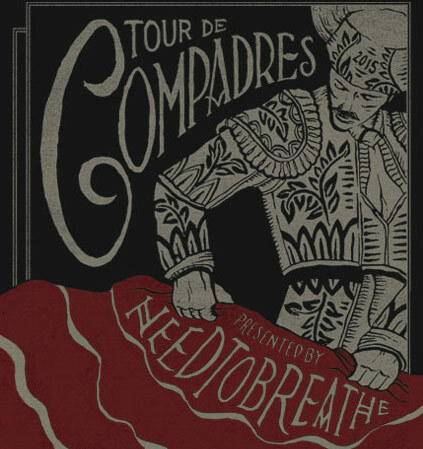 NEEDTOBREATHE's TOUR DE COMPADRES will be coming to an end this month (cue Full House studio audience: "Aww."). The band writes, "We feel like we say it after every tour, but this really has been our favorite tour to date. We have had a blast all summer playing music with some of our best friends in the world and seeing all your smiling faces. Our jobs are super cool. We have had so many amazing nights on this tour including shows at the Greek in LA, a SOLD OUT Red Rocks show (which was our biggest headlining show EVER), and so many more incredible experiences. Thank you for making TOUR DE COMPADRES one of the best tours we've ever done. We still have a handful of shows left on the TOUR DE COMPADRES with Switchfoot, Drew Holcomb & the Neighbors, and Colony House. So if you haven't got your TICKETS or VIP UPGRADES yet for the rest of the tour, it's not too late! Check out the link below for more information. Grab your friends, your cousins, your cousin's cousins and their friends, and come out to the show! Don't miss out." NEEDTOBREATHE adds, "One of our last shows on the tour is at the brand new Ascend Amphitheater in Nashville. We're honored to be one of the first bands to play at this new venue. We are also excited to announce that we've partnered with TIDAL to Live Stream the show on August 14th. Mark those calendars people and join us online at 9:30pm Central! You can RSVP on Facebook to ensure a reminder before the show starts. Watch the show live on TIDAL. Well, thats all for now. Thanks to everyone who has come to a show this year and for making 2015 one for the books.